Very cute outfit, I love the length of your skirt and your nails are great too. Nice purse! you look very bohemian and chic. love this entire look. i'm not sure i can rock this one though. love that necklace of yours. i saw one in penshoppe and i didn't really like the quality of it. Oh, I love this gypsy look on you. This outfit is perfection! I love the boho vibe! the turban really looks good on you! ;0 and great shoes btw. And that bag you just bought, reminds me of Chloe's Poya Satchel, it looks just as cute but in a dusty rose color. Very cool outfit. The colors and the styles just work great. hey thanks for your comment on my blog, following you now, would love for you to follow me to. Love the bag in this post! cute, cute, cute! love that skirt! it's been super hot here, then the past couple days thunderstorms! so cute, the outfit is beautiful! WOw! so boho-chic! Love it! And that necklace looks nice too! I can see why that's your dream bag. It is amazing. And love the rest of your outfit as well! you look so great - i love the flowiness of this outfit! Hey gypsy you! looking awesome! Those accesories are lovely and i still can believe how u manage to do your errands in those platforms! You look lovely!! 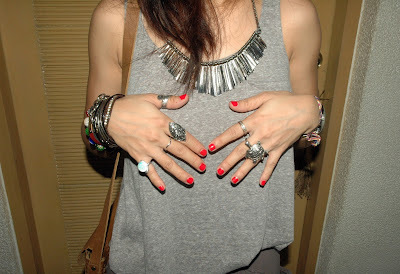 Your outfit is great and loving your rings!! Just like your facebook page hope you can add me too as friend to connect there too! Half of my closet is filled with gray articles, I love the shade! I like how the red nails are a pop of color, too. Your necklace is great! It can definetely light up an outfit! Oh I just love your accessories. I love it when accessories appear like they're doing the talking. lol. I usually stack bracelets and rings. I love it. You look beautiful. As always. I just adore how fresh you look. 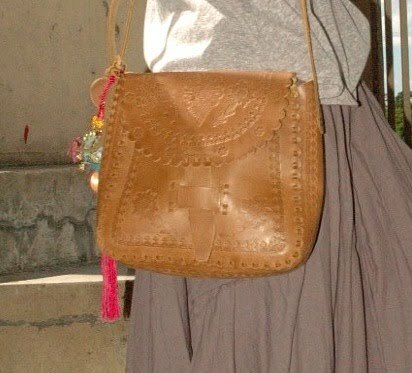 The boho/hippie look really suits you and that bag is so YOU :) glad you found it! Wow so impressive costume, so fashionable it is. Like to see more updates it inspire me to choose costume.